I made a simple sugar for this by melting one part of sugar in one part of water (3 tablespoons of each.) Alternatively, you can use just the sugar instead, but it will make the drink a little bit sweeter. Also, I went to the salad bar at the grocery store and bought some sliced honeydew and cantaloupe to use as garnish, which definitely saved time. 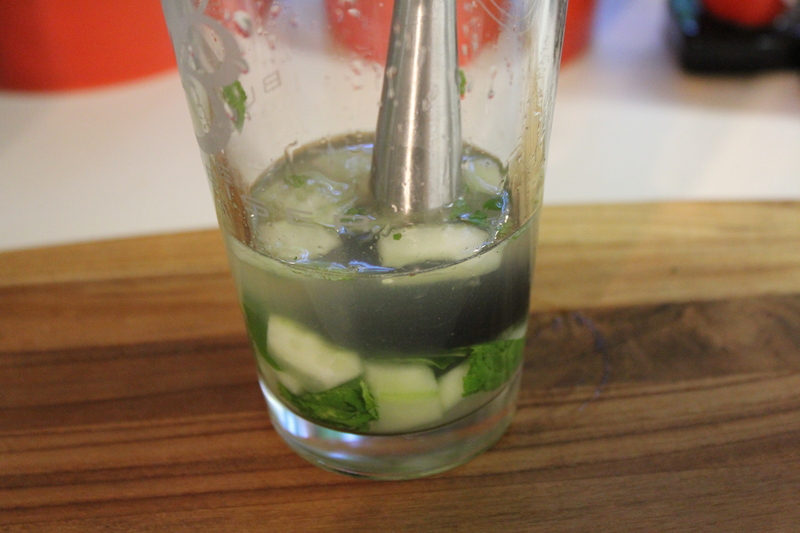 Place the cucumber, mint leaves, simple sugar solution and lime juice in a large glass, and muddle for several minutes until the cucumber and mint start getting squishy. Add the rum and Midori and then pour into a cocktail shaker full of ice. 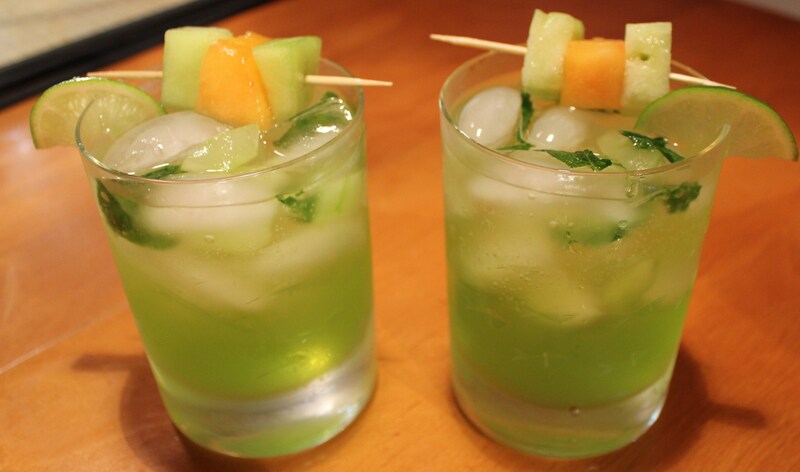 Pour the mojitos into two cocktail glasses full of ice. 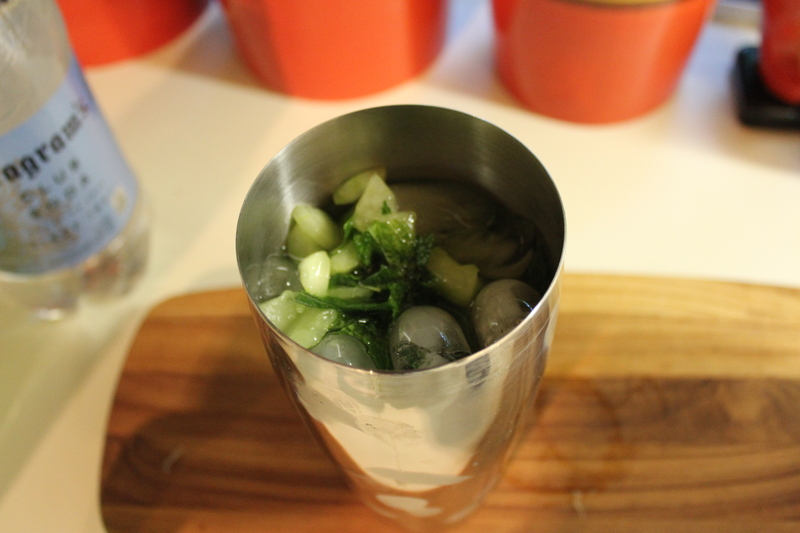 I like to add some of the cucumber and mint that is left in the cocktail shaker. Top off with the club soda. 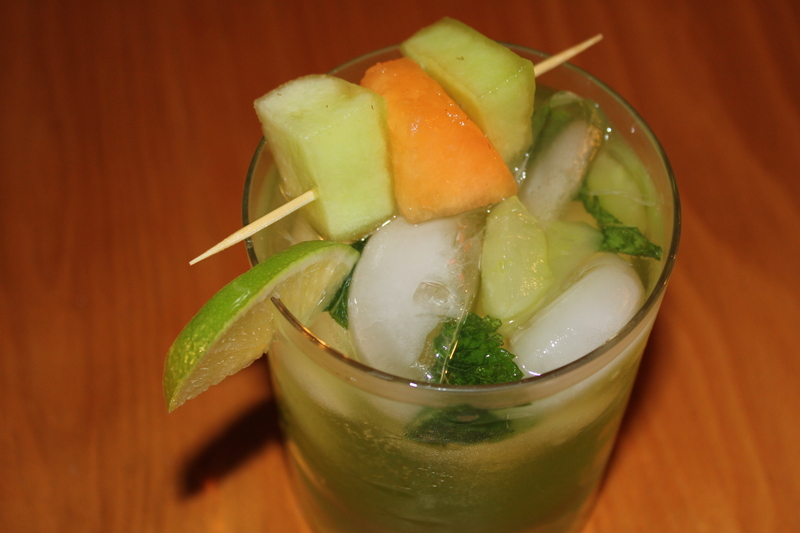 Garnish with the lime and melon and enjoy! 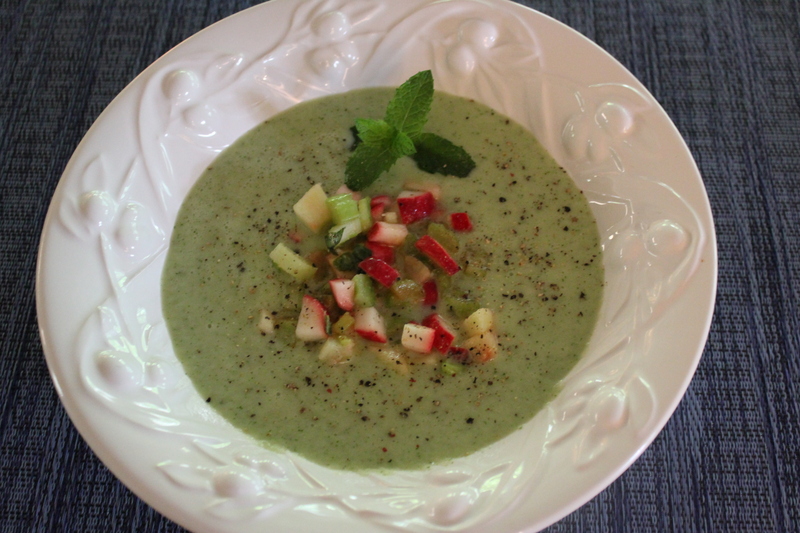 If you love the taste of cucumber and melon together, be sure to try my Chilled Cucumber Melon Soup with Radish Celery Salsa — it hits the spot on a hot summer day. 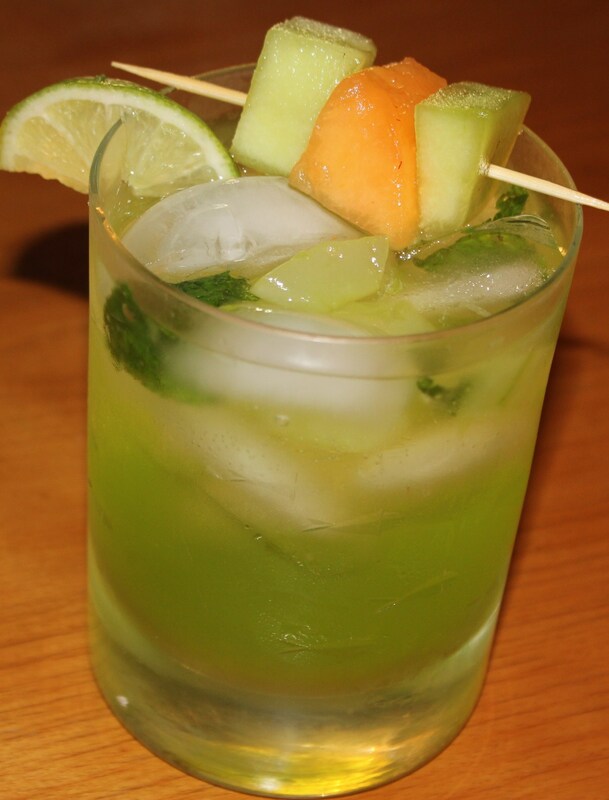 This entry was posted in It's 5:00 Somewhere and tagged cucumber mojitor recipe, eat drink and be merry, it's five o'clock somewhere, kel's cafe of all things food, Kel's cucumber melon mojito, Midori melon mojito, Mojito recipes. Bookmark the permalink. ..in my opinion use either raw or organic (coarse) sugar. 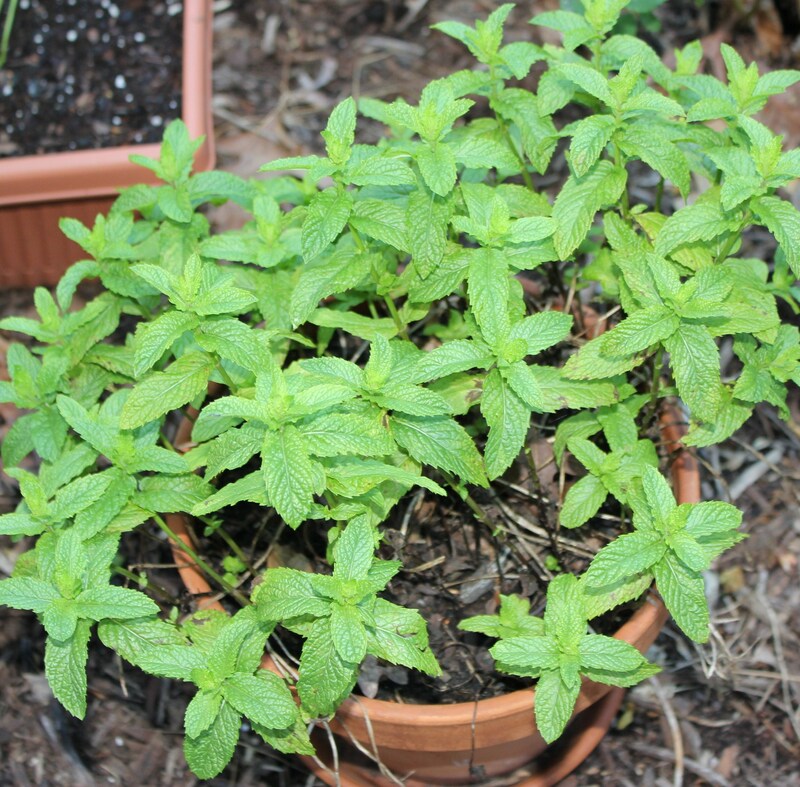 Mint leaves are muddled (with a muddler, which looks like a melon baller, but is instead heavy, round & solid) – in other words, mashed & ground into the sugar – that process releases more oils from the mint. 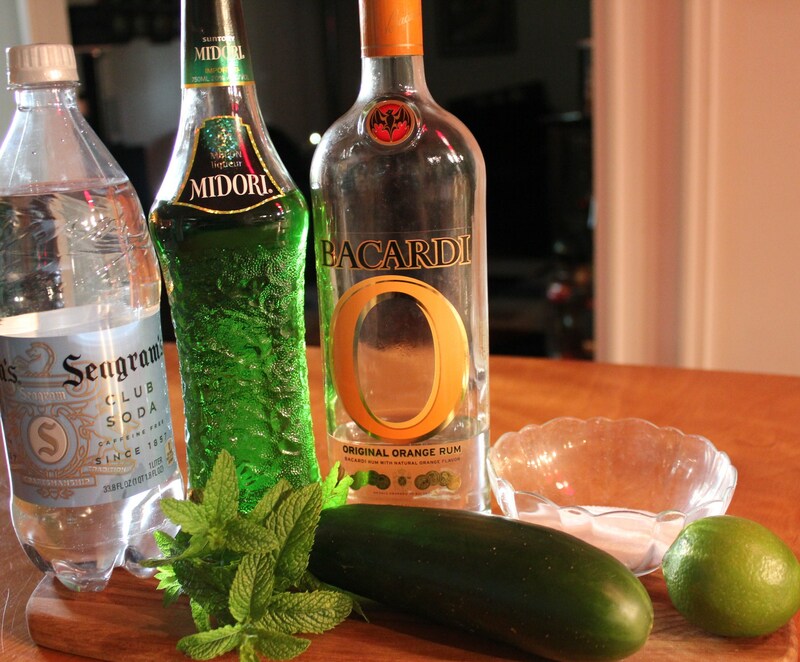 I like to drink the mojito through the sugar muddled in the bottom of the glass – I used to avoid tropical rum drinks because they were too sweet, but Mojitos are great – a drink & a breath mint all in one! I agree, Shirley, mojitos are awesome, and like you noted, not too sweet. Thanks for visiting Kel’s Cafe!